Need advice on how to get from the airport to town, and getting around town for Cape Town and Johannesburg? The biggest legacy of the 2010 World Cup was improvements to public transport in the major cities, and this is now ongoing with extensions to the services established for 2010 visitors. The advice provided here is primarily for travellers and tourists, and does not address commuter travel. How safe is travel in SA? For the most part, as safe as other first-world destinations if you stay on tourist routes and use tourist-orientated transport. Travelling in groups is safest and, if travelling by car, caution against car-jacking needs to be exercised. For more on security precautions, click here. In addition to the information under the tabs below, you'll also find more detailed information under Attachments towards the bottom of the page which you can download. A ticket for adults is R53.00, children 4-11 R26.50 and children under the age of four are free. Get tickets at kiosks at Civic Centre station and Airport station (cash only). The most convenient way to get from the airport to your destination is by direct, door-to-door transfer. First Car Rental also offers a flexible door-to-door service. Click here for prices and to book online. A standard taxi/cab fare from the airport to the city centre is about R200. Cape Town has the best developed suburban rail network in South Africa although the rolling stock is old and due for replacement. It is widely used by city commuters daily. Metrorail's route from the city centre to Simon's Town, where the track is right alongside the ocean between Muizenberg & Simon's Town, is a popular tourist excursion. Tickets for the Gardens - Civic Centre - Waterfront and Table View area feeder services are R5.00 and the Table View - Civic Centre trunk route with free transfer to feeder services are R10.00. Children under the age of four are free. Click here for the route map. To make the most of a destination, take advantage of one of the multitude of tours offered by professional guides. This is an experience you should try at least once in a lifetime, if you're not a member of the jetset and glitterat! Few cities offer such a dramatic landscape that needs to be seen from the air. So just going UP may not be going anywhere, but it's a trip you'll remember for a lifetime. A 20-minute flip taking in the Atlantic suburbs -- Waterfront, Sea Point, Clifton, Camps Bay, Hout Bay -- Table Mountain and City Centre costs R0000 per person. For travellers though, you can fly between Cape Town International Airport and many landing spots such as V&A Waterfront, Winelands and helipads at some hotels. The Airport-->Waterfront trip costs R1500. Huguenot Tunnel -- between Paarl & Worcester on the N1. The fee for light vehicles is R25. Chapman's Peak Drive -- scenic route between Hout Bay & Noordhoek. The fee for light vehicles is R31. This has revolutionised public transport around Gauteng, especially the airport – Sandton and Johannesburg – Pretoria routes. There is a detailed train timetable for download under Attachments below, but a one-way ticket between OR Tambo Airport and Sandton costs R125 (children under 4 free). The route between Johannesburg and Pretoria costs R70. Trains are frequent (as often as every 20 minutes or less in peak times) and safe. 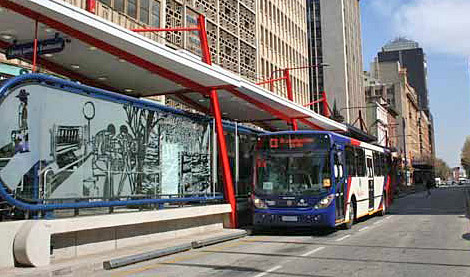 Rea Vaya is Johannesburg's Bus Rapid Transit system but it caters for local commuters more than travellers and tourists by virtue of the destinations it services. There is a useful inner-city route, however. The full route map can be downloaded under Attachements below. If you travel by car, you're double taxed in Gauteng – both the road levy (included in the fuel price) and Gauteng's toll fees where motorists pay R0.40 per kilometre with an e-tag, and 48% more if they are a casual user. All South Africa's major airports were upgraded for 2010 World Cup and longer term needs. It's worth noting that Cape Town International Airport is currently the best airport in its class, in the world! Johannesburg is the major hub and also rated highly among world airports, but is let down by security - pilfering is a big problem and passengers must take care of their possessions. With the exception of luxury trains at the top end of the market, rail travel in SA focuses more on the domestic than the tourist market. Blue Train -- world-renown luxury train between Cape Town & Johannesburg. Rovos Rail -- world-renown luxury train between Cape Town & Pretoria, with occasional excursions to East Africa. Shosholoza Meyl Premier Classe (deluxe sleeper trains) run twice-weekly between Johannesburg & Cape Town and the fare is R2210; and weekly between Johannesburg & Durban and the fare is R1010. Shosholoza Meyl Tourist class trains run between Johannesburg & Cape Town daily and the fare is R450; between Johannesburg & Durban daily except Saturdays and the fare is R240; between Johannesburg & Port Elizabeth on Wednesdays, Fridays & Saturdays and the fare is R330. Car transport by train for private motor cars are provided on the Johannesburg--Cape Town and Johannesburg--Durban rail routes on car transport rail coaches attached to Tourist Class and Premier Classe long distance sleeper trains. Needs some investigation before any names are mentioned! car transport by train for private motor cars on rail routes Johannesburg - Cape Town and Johannesburg - Durban on car transport rail coaches attached to Tourist Class and Premier Classe long distance sleeper trains.